Is THIS the best that the trustees can do?!? Let's take the boxed points one-by-one, shall we? 1. We will work with you to build - and grow - your union through transparency, democratic accountability, and increasing workers' strength. Retort #1: Transparency? Democratic accountability? You mean, like the vote where 68% of all eligible nursing home voters returned ballots indicating by a 99:1 ratio they would like to stay in UHW? Or are you referring instead to the "celebration of union democracy" that was the statewide poison pill vote sent out to over 300,000 people, with under 25,000 ballots returned (8.3% return rate) but with in excess of 125,000 different validated protests to that ballot? Because when we're talking about "democratic accountability" it sure would be nice to know the Purple Plague definition of the term. 2. We will work with you in a democratic process. Workers will elect stewards and bargaining committees. Rank-and-file members will ratify contracts. Retort #2: In UHW, rank-and-file members WERE the bargaining committees (along with, of course, management representatives) - and thus could take back to the membership some actual information rather than waiting for the information to come down from On High, brought forth by the cloven-hooved minions of Our Glorious Maximum Leader. 3. We will work with you to hold stewards and other elected leaders accountable to the entire membership. 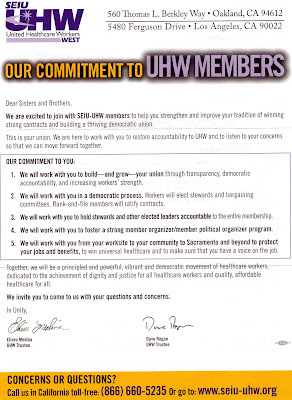 Retort #3: If that is indeed the case, then SEIU would not be interfering in the efforts of UHW members to develop their own member-driven organization. I would instead opine that in the Purple Plague mindset, the only accountability that stewards and elected leaders should bear is to Our Glorious Maximum Leader. 4. We will work with you to foster a strong member organizer/member political organizer program. Retort #4: Uh....yeah... When y'all get some actual member organizers, rather than unshaven buck-toothed scabs bussed in from all parts of the nation, then we'll talk about that. 5. We will work with you from your worksite to your community to Sacramento and beyond to protect your jobs and benefits, to win universal healthcare and to make sure that you have a voice on the job. Retort #5: See Retort #4 above. Regan and Medina close with the following: "We invite you to come to us with your questions and concerns." One picture truly does say a thousand words, yes?